I usually do not make a monochromatic card but I thought it would work well with this DSP. I started by going through my scraps of DSP (of which I have many) and then I just need to decided what would work at the bottom corner. 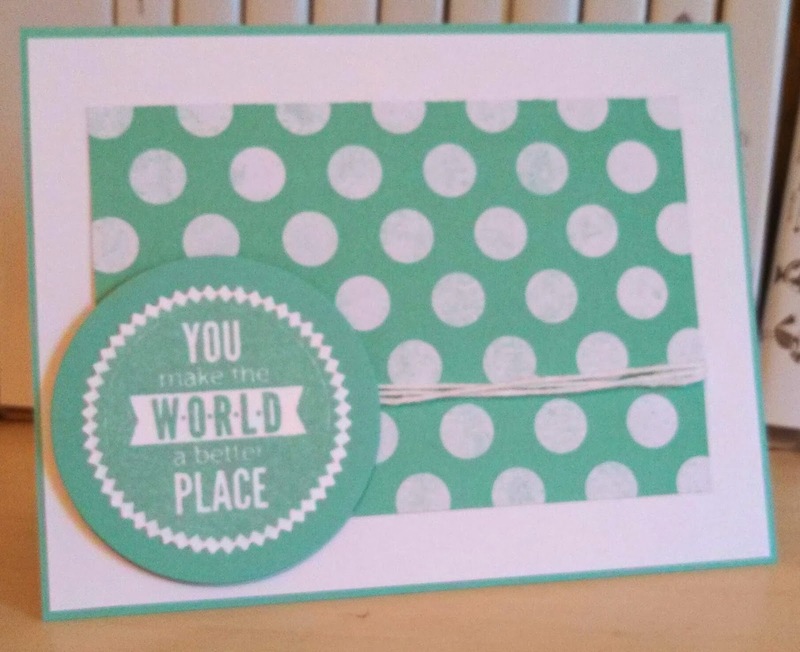 I did want something on a circle and since I am still making and mailing out thank you cards from my birthday last week, I thought this sentiment would be in order. 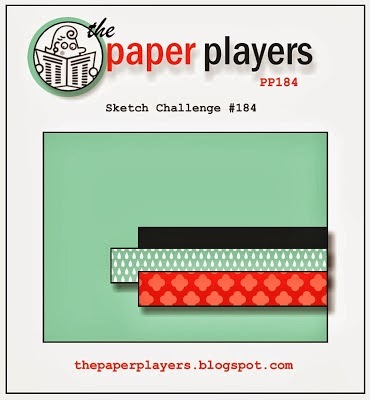 When I saw this sketch challenge by Nicole Watts, I knew what element I would use on the panel in a three count. 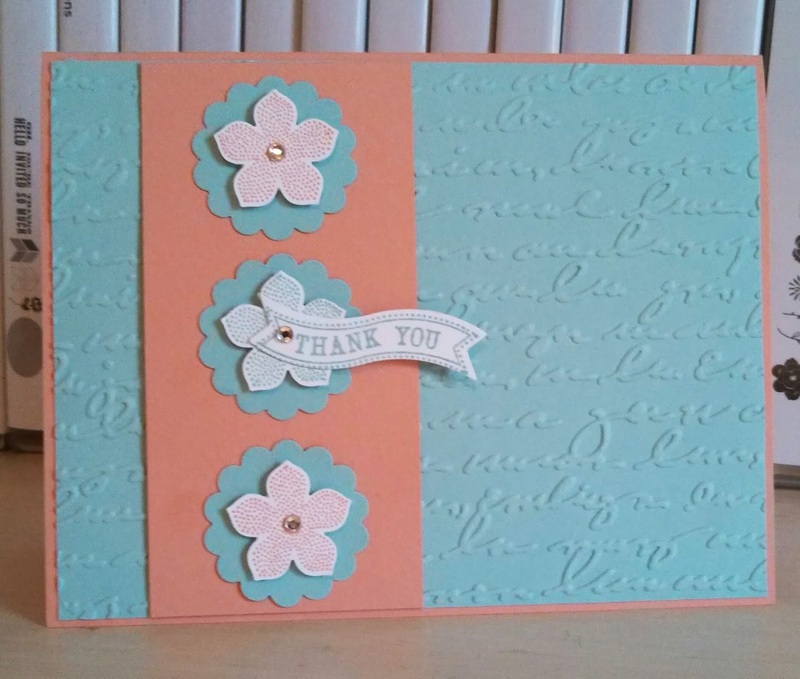 I have been using the Petite Petals set and punch a lot lately. 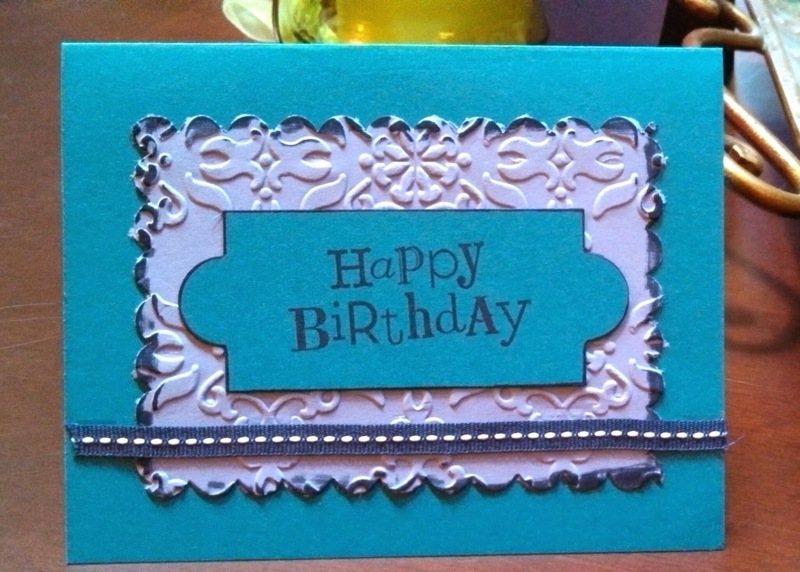 I already had this card base and the emboss paper on attached sitting on my desk for a few weeks. So it was easy to add the panel and flowers to it. I hope you have a lovely Thursday and thanks for stopping by! This is a very special birthday card from a very special friend. Jen and I have been stamping together for about 10 years or more and have become great friends. I can't image not having her in my life! She is such a blessing and is amazing at crafting and designing. She also has the patience to cut and work the intricate stuff I do not have the patience for. I am not such a fussy cutter. My favorite color is purple and she did a beautiful job with adding purple with the right amounts of green and other shades to make a lovely color combo. 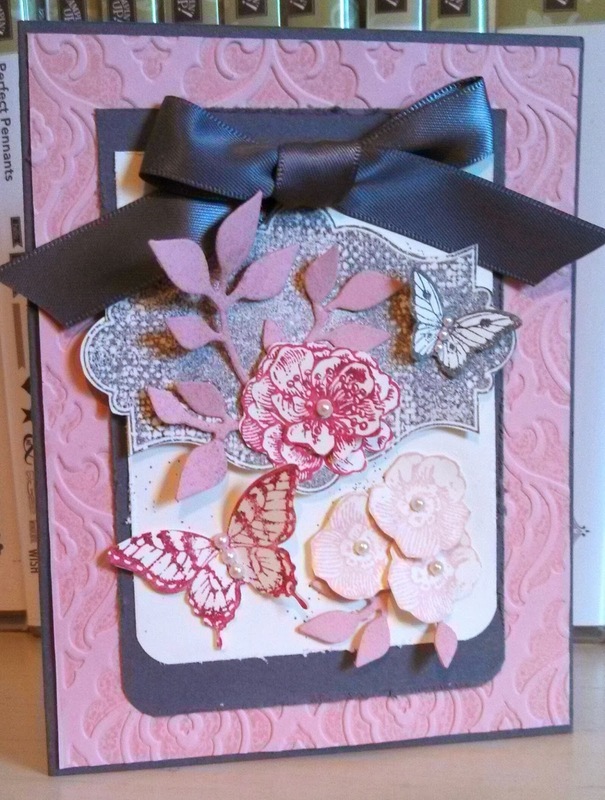 I also love distressing and this card has it on the outside and the inside. I feel so blessed to have someone take the time to make me something so wonderful and make me feel special! I hope you have a blessed Wednesday and thank you for stopping by! 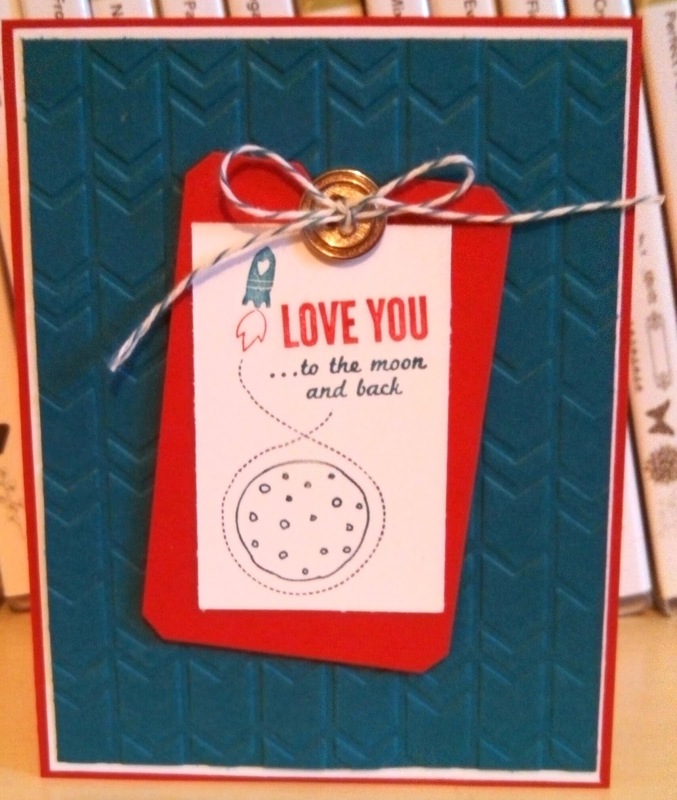 My husband decided the night before my birthday to go in my stamp room and make me a card. He used my Big Shot to die cut the Happy Birthday shape and the used it to emboss the purple paper. I was very impressed. He used purple knowing it is my favorite color. 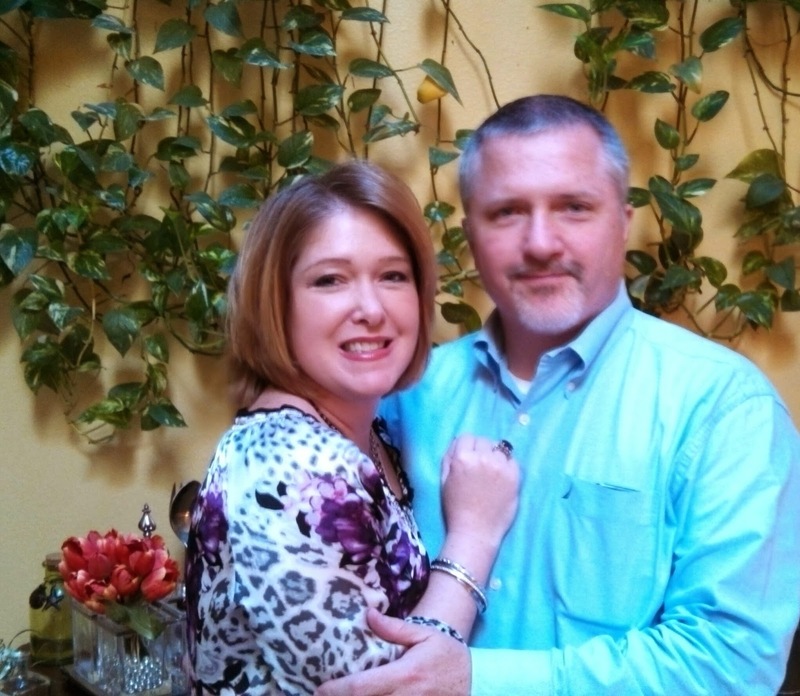 Here is a photo of us on my birthday! The sketch was easy...I thought of my washi tape. I had the cork flowers/embellishments on my desk from the sale-a-bration Sweet Sorbet accessory pack and wanted to use them. So I decided some gold washi tape would look great with the flower (which is self adhesive )! Gold twine and gold ink finish it off. Hope your Monday is fabulous and thanks for stopping by! Not only am I blessed with many friends but several whom are so talented and I have enjoyed stamping with for a long time. 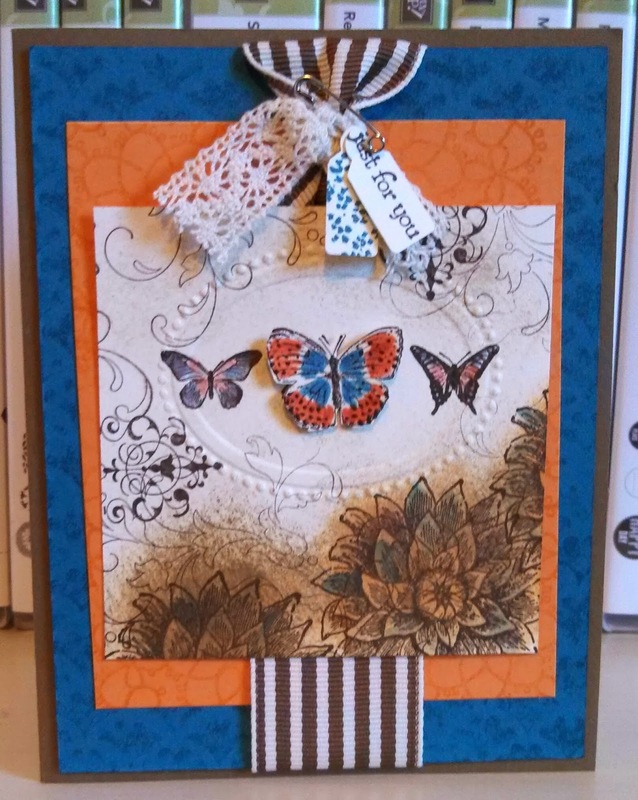 This card is from a good friend, Michaelle, that I have the pleasure of stamping with several times a month and I love her creativity! 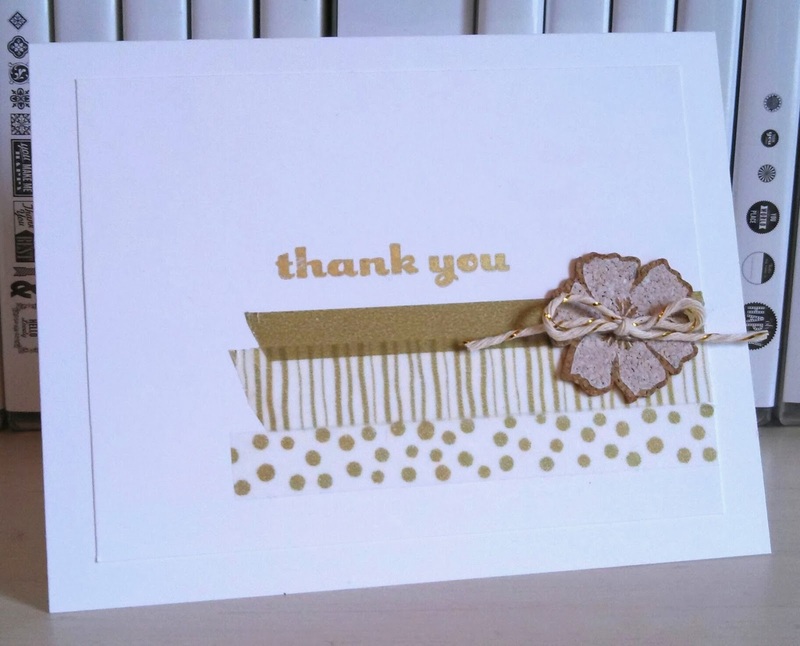 I love all the layers and the stamping in layers that make this card so rich in texture! I am wishing you a lovely Sunday and thanks for stopping by! I received this beautiful birthday card from a friend this week. She knows I love purple and her favorites are purple and green so I think she did a wonderful job expressing us both. Love the ribbon that has been dyed Garden Green..it reminded me of grass and it is so clever! I hope you have a blessed Saturday and thanks for stopping by! This sketch came at the right time! I needed to make another wedding card. I loved Narelle Farrugia's card for this sketch. I thought it would make a beautiful wedding card. 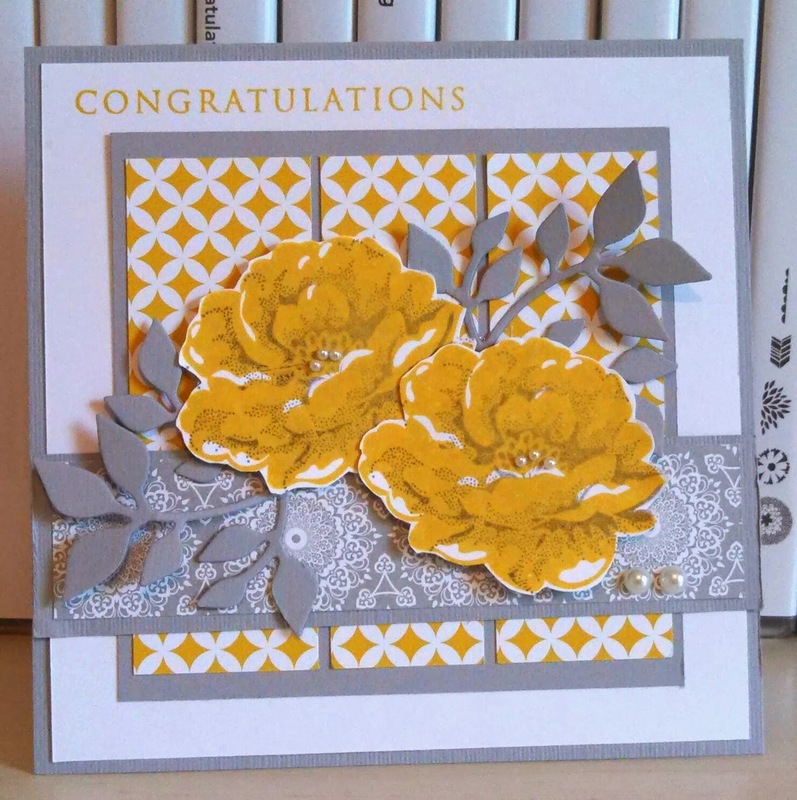 I stamped the roses in Crushed Curry and outlined stamp in Basic Gray as the slate was not dark enough. Thank you for stopping by! A great sketch today by Margaret Moody. 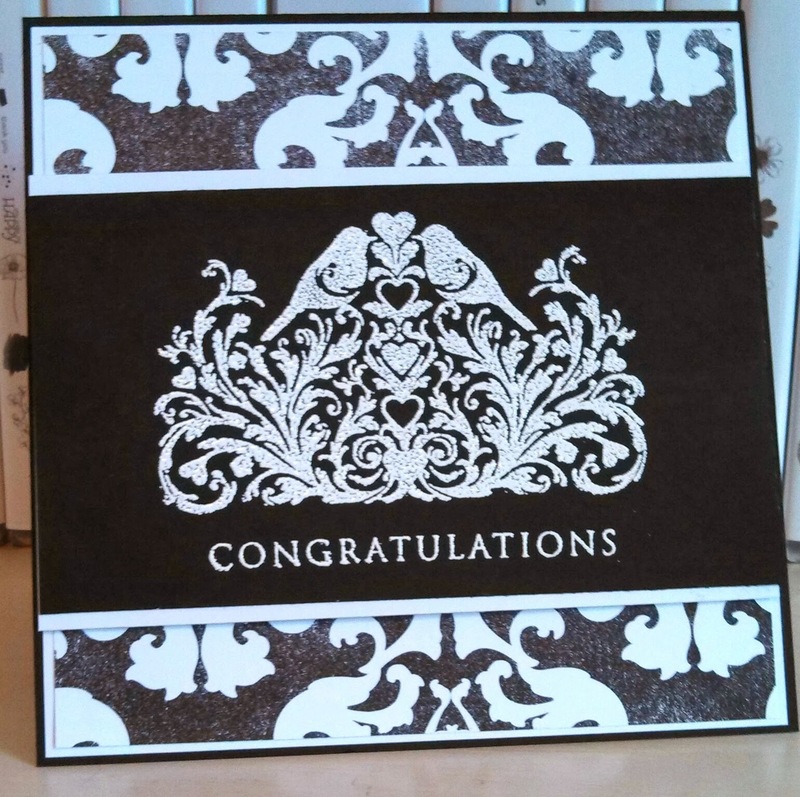 Thankfully, I just made a card like this a few weeks ago for card class using the Hardwood stamp and Crumb cake and the banner dies. I decide to revisit them and use different colors and some Fresh Prints paper. 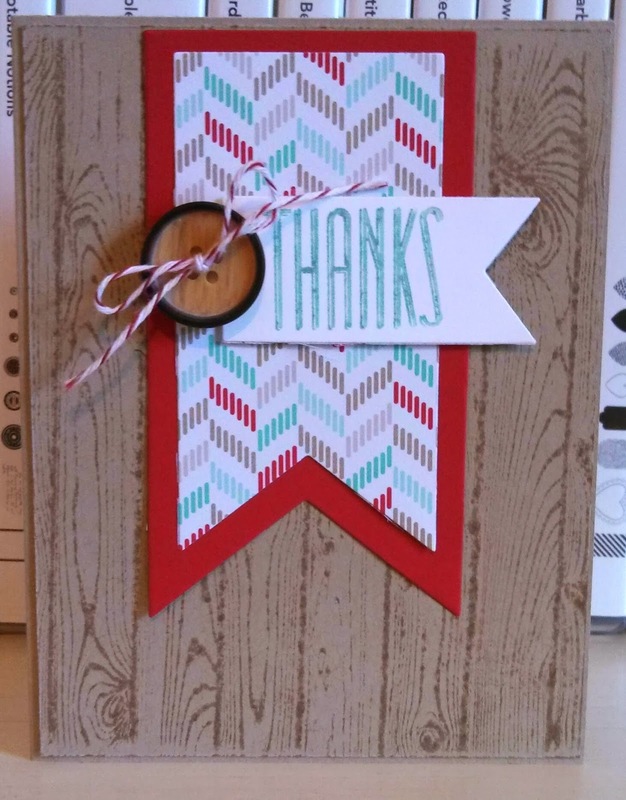 I am in need of some thank you cards for the lovely birthdays gifts I have been receiving this week and wanted to use the Thanks from the Hip Notes set...perfect fit on the banner die. I hope you enjoy your Thursday. I will be enjoying another birthday lunch out with a friend and then a big birthday dinner tonight with a group of friends! I think I am eating too much this week! I can't believe it is already February 19th...today is my birthday!!!! I am planning on lunch with a friend and out to a great dinner tonight with my two favorite guys! I hope your day is special, too! made and so I cased from her. 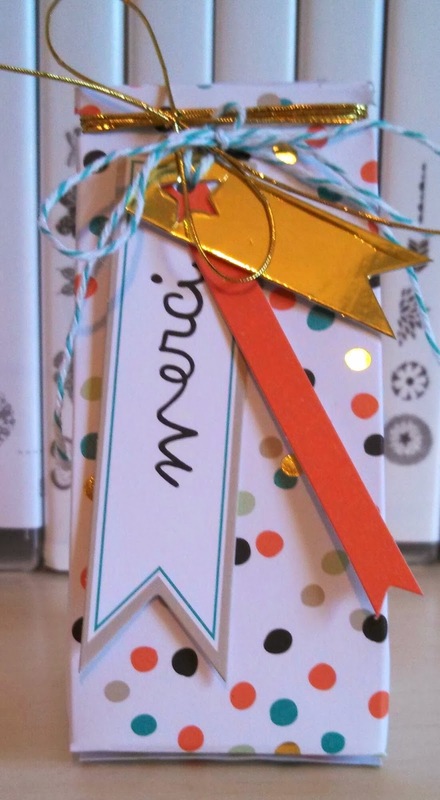 Lately, I am not adding ribbon much to my cards or projects but this is a great way to add ribbon and make a statement! Thanks for stopping by this Wednesday! We made these cute treat boxes at club last night. They are using all items from the Good as Gold card kit in the SAB. 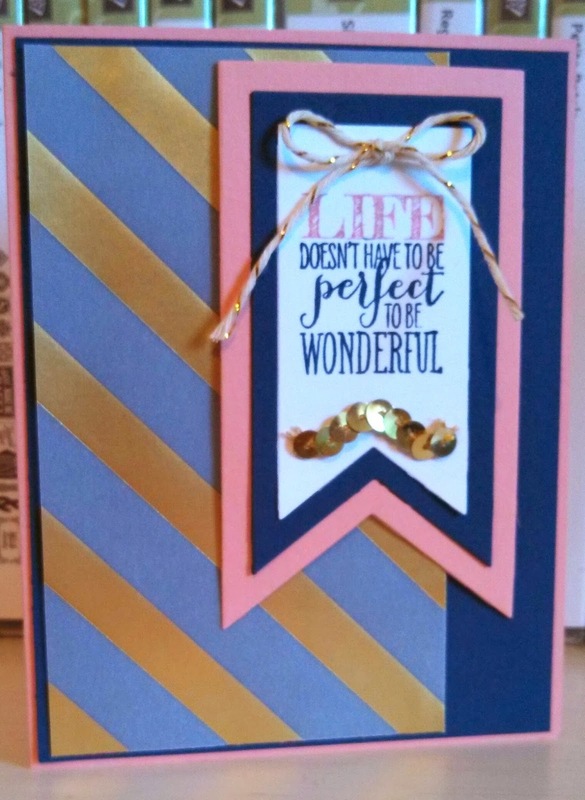 It is a kit where you can make 8 cards easily and includes envelopes and even gold envelope liners. I saw this done by another demo, Dawn Olchefske, at dostamping.typepad.com. You can see her video there. I put a Godiva truffle in mine and will give away to someone this week. I love how everything is already cut and ready to use in the kit and for decorating these boxes. The making of the box is so easy and fast. SAB-sale-a-bration runs now through March 31, st. When you purchase $50.00 in SU! product, you can pick a free item from the SAB brochure (13 items to choose from)! This Good As Gold card kit is one of them! 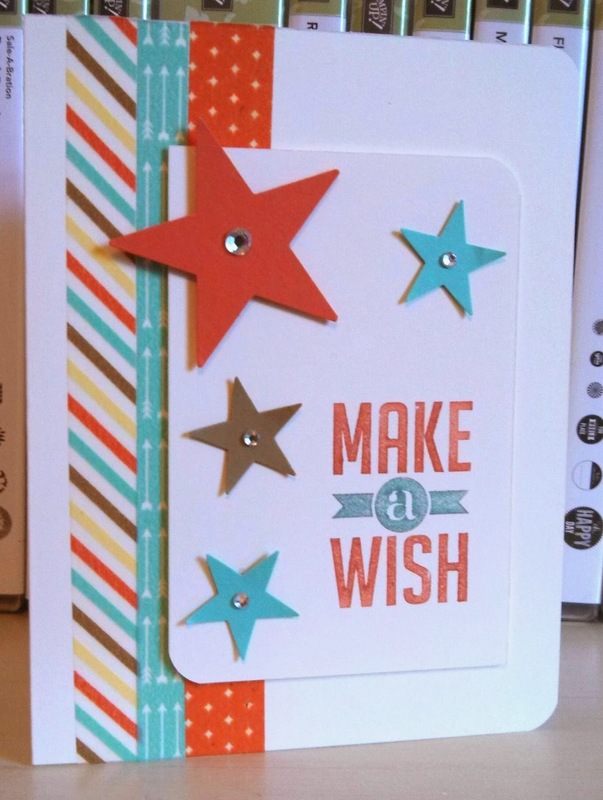 Stars on the card/project? 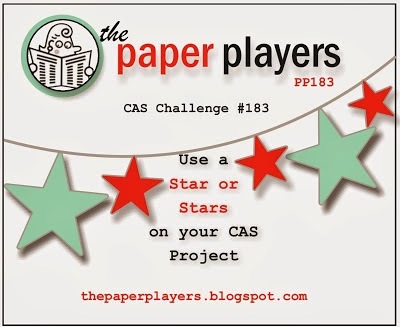 I can do that and then I sat for a while staring at blank paper for a sketch idea to use the stars. 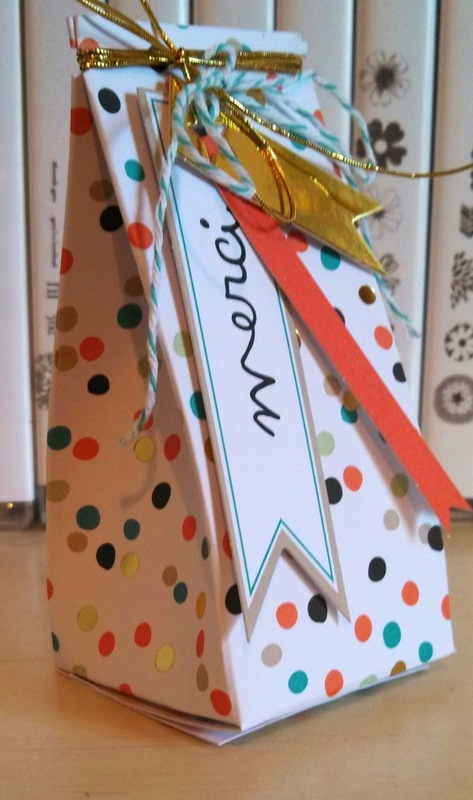 Then I thought it might be good to pull some washi tape out and use. I have not used the Retro Fresh washi yet so there was my color combo. 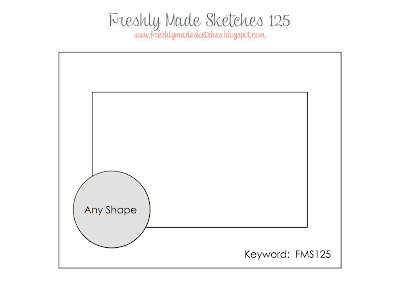 Still no sketch idea so went looking online for examples using this Retro Fresh Suite and saw a great card by my upline, Mary Fish of stampinpretty.com. I used her layout which happen to be a MOJO Monday challenge sketch. I love when it all comes together in the end and you think..."why was that so hard!!!" Hope you have a magical Monday and thanks for stopping by! I Love this card! I do love Black and White!!! I made this for a friend's niece's wedding and I sent her a picture so I could know if she was ok with black and white, too. She loved it and wants another like it. I do hope SU! has a great new wedding set in the annual catalog coming up in June. I need to add another to my stash of sets! I hope your Sunday is great and more colorful! 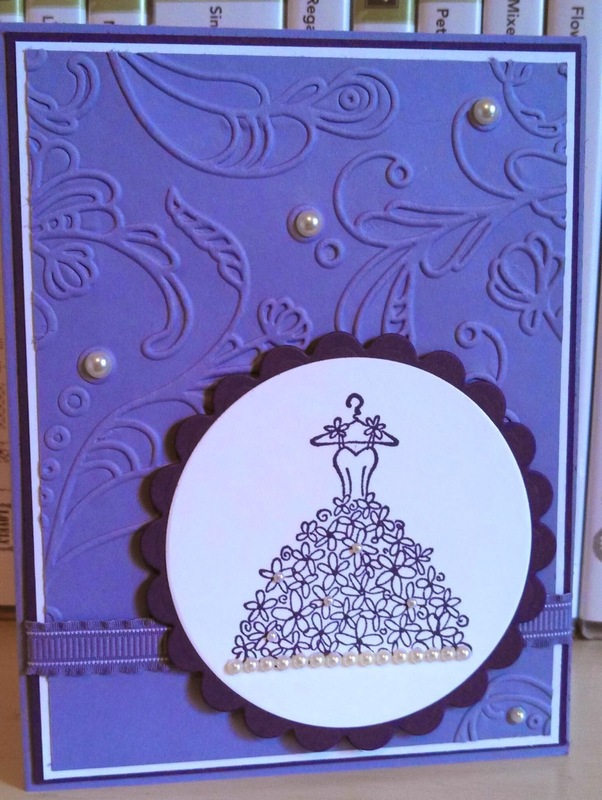 I was asked by a friend to make a Bridal Shower card for her niece and and a wedding card. She said any colors and I, of course, am going to go with any shades of purple. I used a retired set here that I borrow from a good friend who seems to have everything! I need to work on more wedding and such sets. 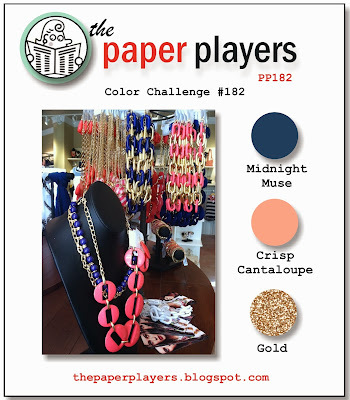 FMS 123 Thanks Petite Petals! I liked this sketch because it made me think of something I want to make 8 of! I love the Petite petals and matching punch! The colors came quickly as I picked up my Watercolor Wonder DSP (I am ordering next week another pack of it!) and picked the colors I have not played with much together yet! I love the freshness and clean look of this card! Enjoy your Friday and Happy Valentines's Day to all!!!! that this was the one! I had already pulled out this piece of DSP that had Pumpkin Pie on it to hopefully get me started and it worked as a background giving some texture there! Just a simple sentiment with the banners and I was all set...took almost no time to make! I like that timing! My daughter and friends say "oh snap!" and I thought this would be a cute card to send her at collage. Nice bright colors and patterns! 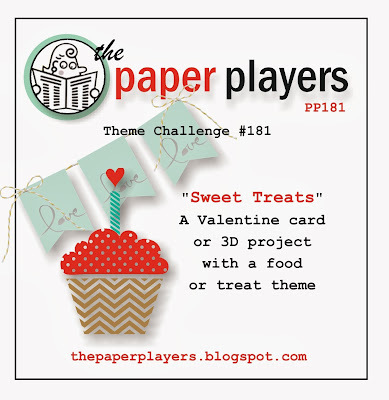 The color challenge this week was one I had to think about but I had a this piece of gold vellum cut and laying on my desk from another project so it was going to get used! But layout..that is my challenge and then i thought of the banners and the is set and it came together quicker than expected. 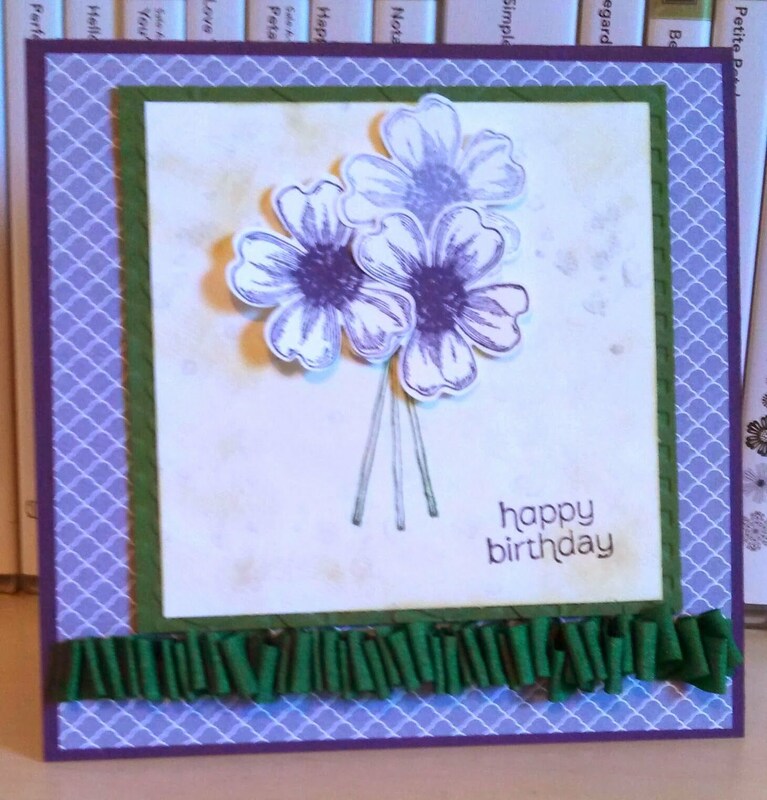 I had this card stock cut from my card class last week and wanted to color in the other stamp here with flowers. 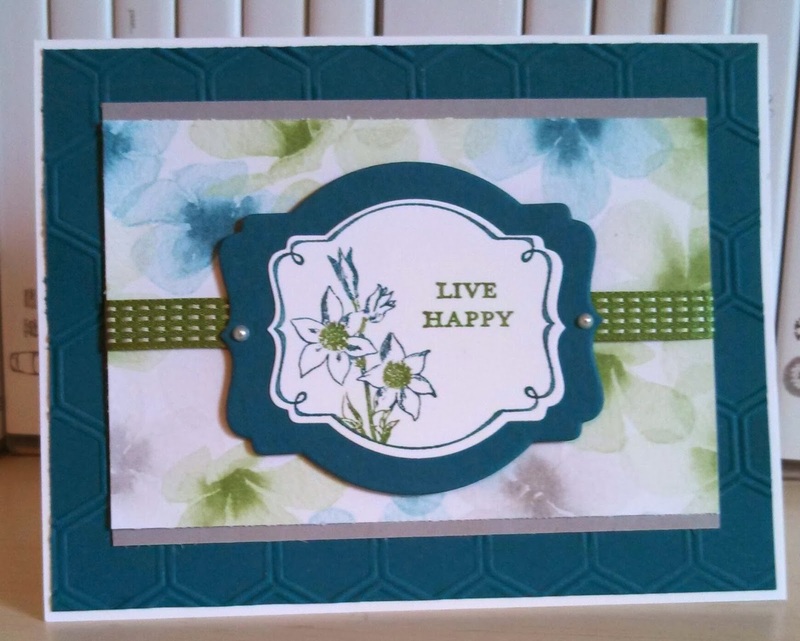 The Live Happy sentiment is not one I would use much but I am sending this to my mom so it fits! Next time I think I will watercolor the flowers. Here I used markers to color before stamping. I love the Watercolor Wonder DSP and now I have no more of this pattern but will probably buy another pack of this DSP to use. 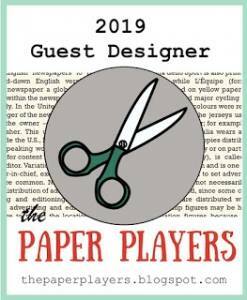 I do not say that about many designer papers! I hope you have a great Monday and thanks for stopping by! 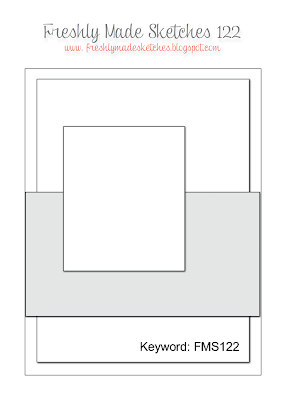 I have another card with same layout as yesterday and also same features. 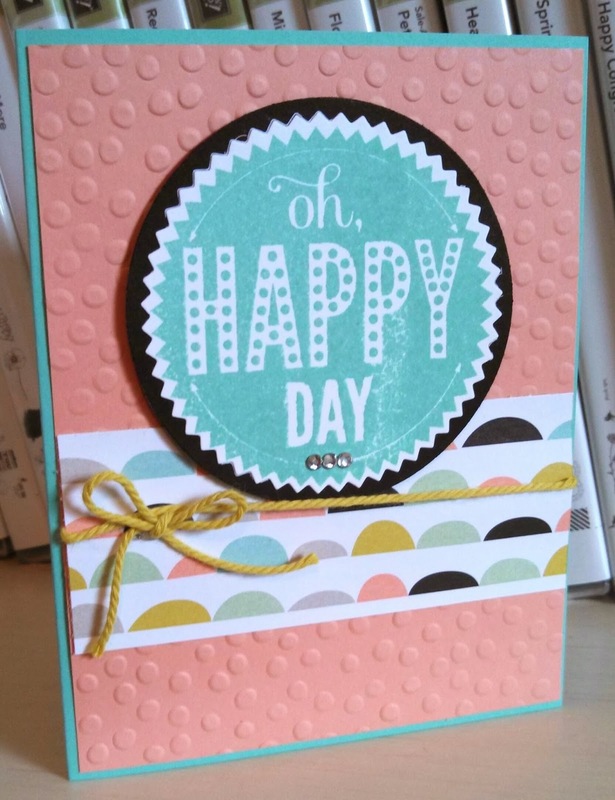 I wanted to show the Starburst Sayings set and dies again but this time with the Oh Happy Day sentiment! I love when things are so matching! Finally playing with my new Starburst Sayings and dies this week! This is a layout I did for a card class this week and I had some card stock already cut so wanted to play with this set and dies. The twine above is in Summer starfruit and comes in the Sweet Sorbet accessory pack you can earn free with a $50.00 purchase of SU! products now through March 31st, 2014 with sale-a-bration (SAB). The pack includes 10 yards each of Summer Starfruit, Crisp Cantaloupe, and Pool Party twine and 1 sheet of adhesive-backed cork with 58 pieces. I will play with those soon and show them off! Great layout by Cindy Hall! 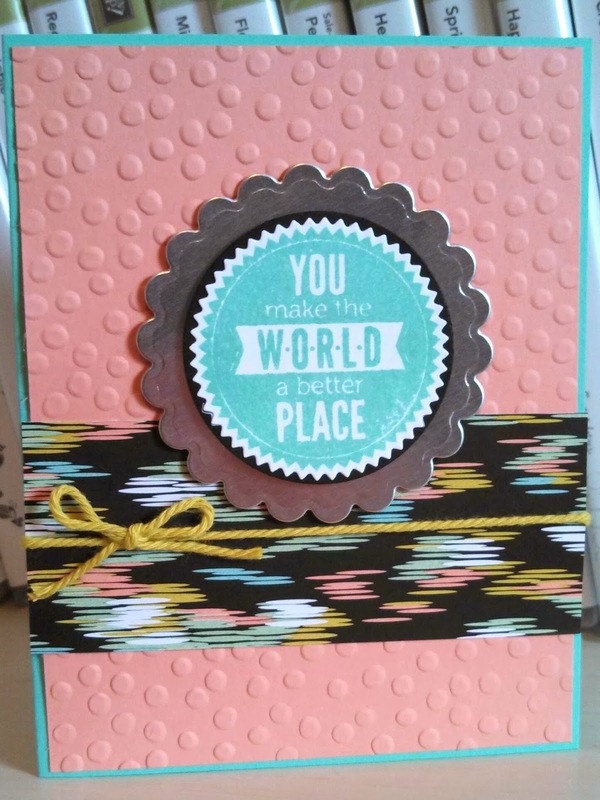 I already had some of this card stock and DSP cut for another project so my colors and such came together easy. 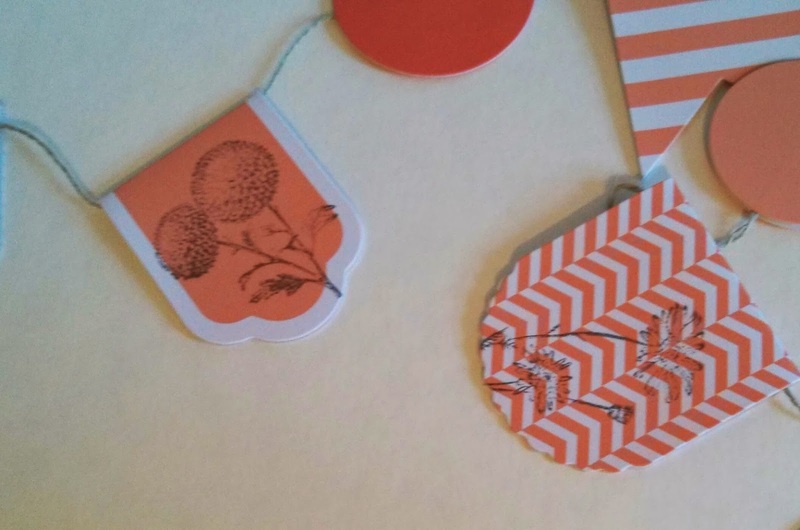 Cutting these flowers out are also easy! I really like how they pop! I started to not put a sentiment on the front so could use for any occasion but it needed something in the bottom of the Very Vanilla piece. Best wishes can be used for several occasions as well. Hope you have a Fabulous Friday and thanks for stopping by! I do not use Rose Red and Basic Gray very much but they do look great with the Blushing Bride! I decided to do a college with a little distressing. 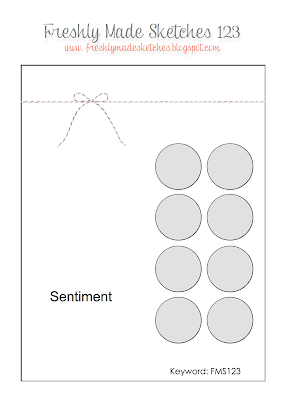 I did not use a sentiment on the front since so busy. I thought I could use this card for any occasion. I hope you have a great Thursday and thank you for stopping by! It is hard to get a photo of something so long. 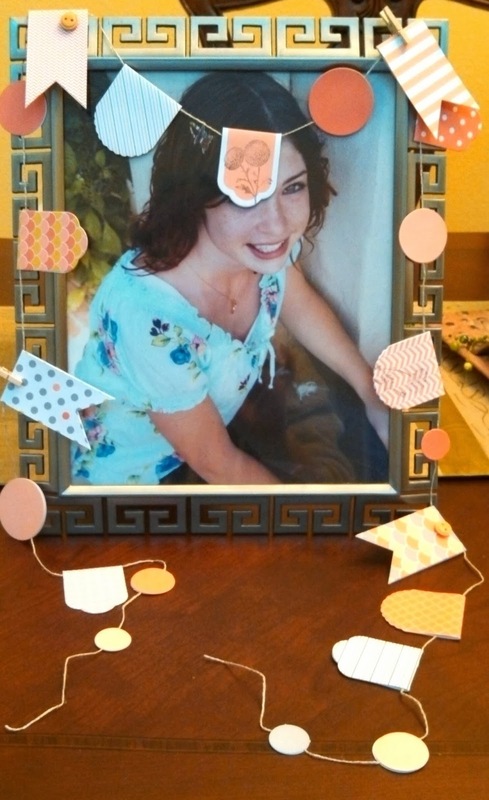 I draped the garland over a photo of my college girl for you to see some details. 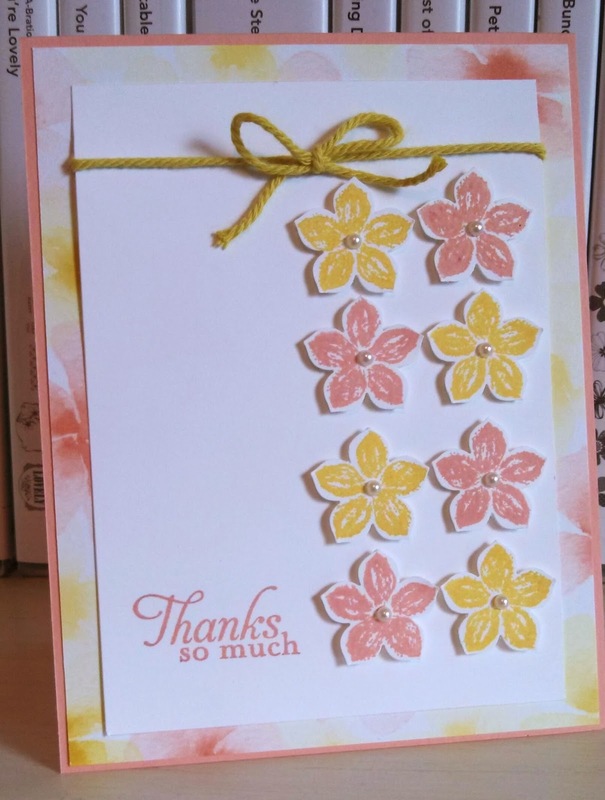 I was asked to put this Springtime Hello Simply Created Garland kit together for a review and was surprised to find it was fun to assemble and there are so many parts that you can make several garlands for the one kit. It comes with a 10' piece of linen thread and I cut it in half for the above garland. I used the pieces that mostly had the coral and cantaloupe colors and there is a whole sheet of starfruit, gray and artichoke left for another garland. The pieces are pre-cut and pre-scored and self adhesive so all I needed was my glue dots to adhere the buttons. 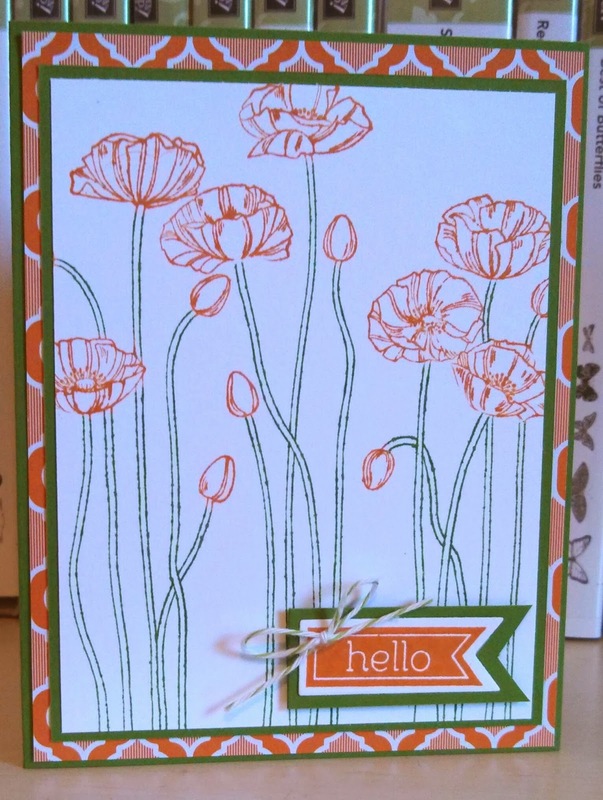 I stamped on a few pieces after placed on the garland with the Springtime Hello stamp set. I think it is a wonderful kit for the price- $8.95 item# 133330 especially since you will get plenty of parts to make one very long or several smaller garlands if you choose. Thanks foe stopping by and have a blessed Wednesday! I made this card for my 15 year old son for Valentine's Day! Since both of my children were babies, I have told them I love them to the moon and back and to the bottom of the ocean and back and to heaven and back, etc. So I loved this sentiment and I think he will, too! I just happen to be in the planning stage to decorate some candy bars for some kids I watch once a month at an event at church. This month it falls the day before Valentine's so I was going to bring them a Valentine's day treat! This is a regular sized Hersey's chocolate bar with Real Red card stock wrapped around it and then I made a belly band with a piece of Fresh Prints DSP. 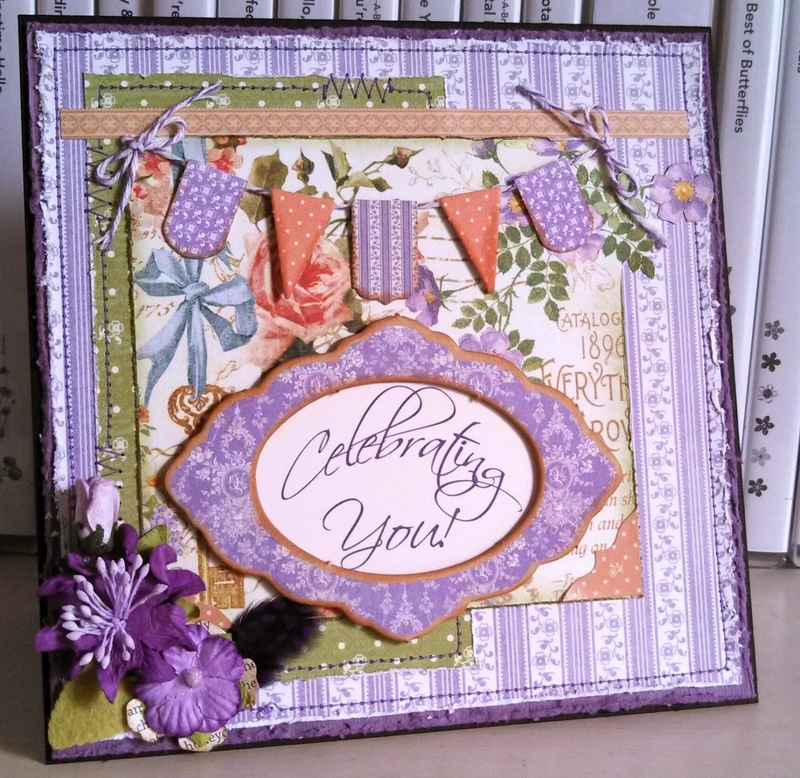 The ends are put through the Scalloped Tag Topper punch that is a new item in our Occasions catalog for spring. I tied it with ribbon and added the tickets. I thought this worked for boy or girl! Hope you are having a lovely Monday and thanks for stopping by! 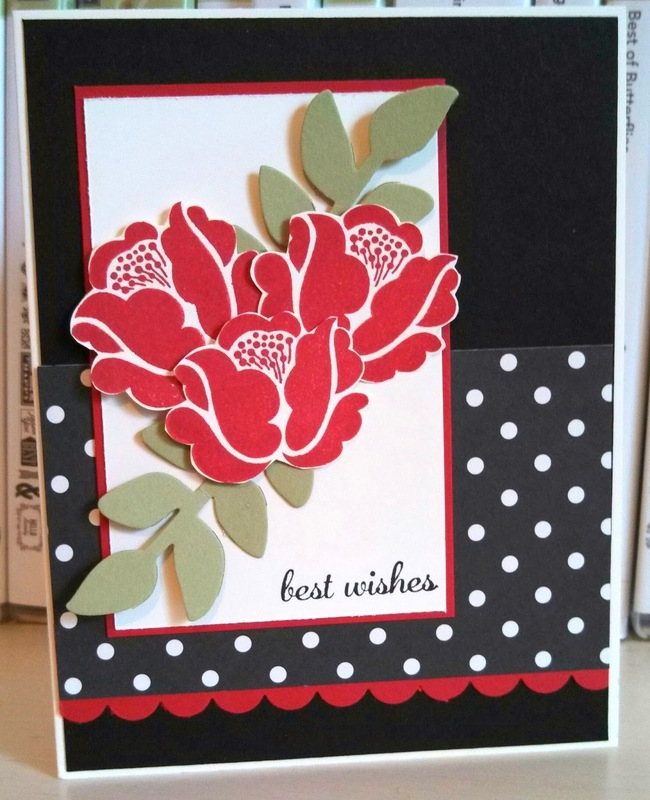 This is my 5th and last card for card class this week! 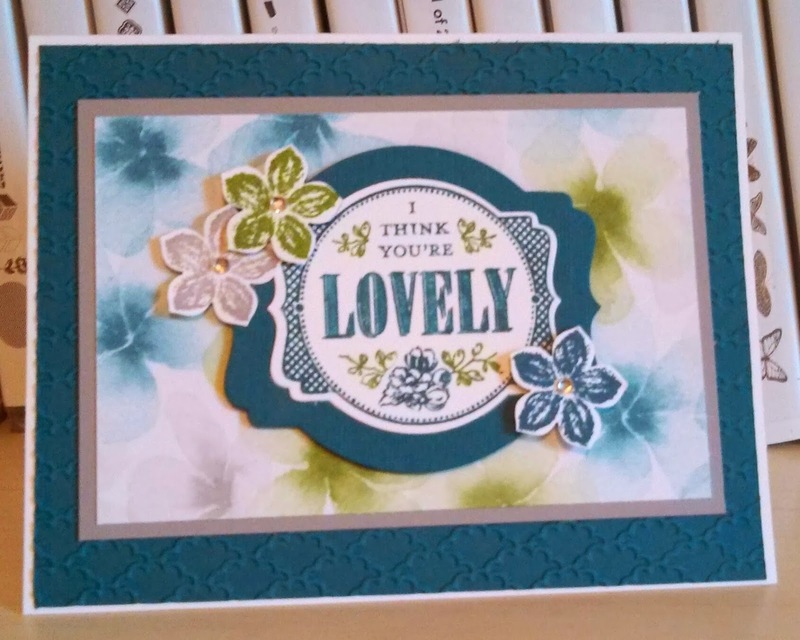 I wanted to use the Watercolor Wonder DSP and nothing was coming together so decided to wait for my new stamp set-You're Lovely and it finally came together! 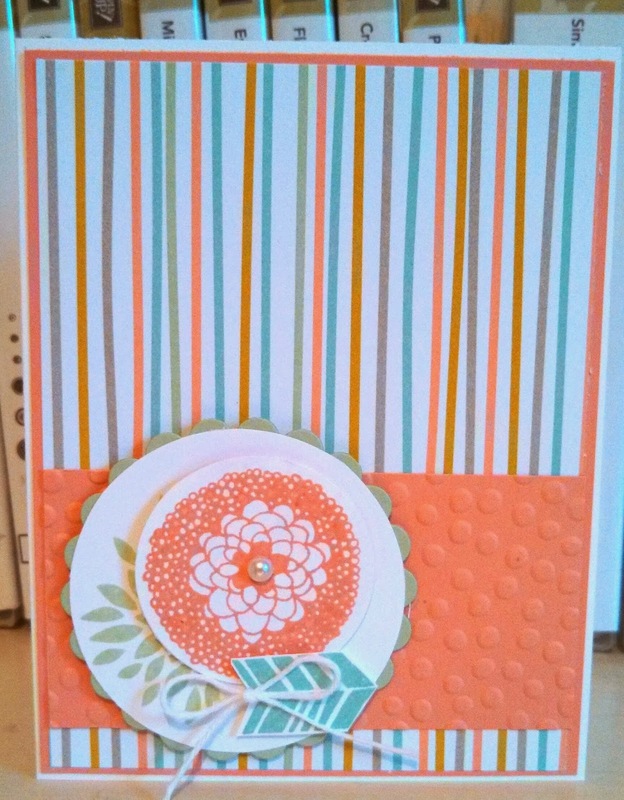 I also used another set from the Occasions catalog called Petite Petals which has a matching punch. Fast and easy but best part was that there was a watercolor flower in the bunch! I hope you enjoy this Super Bowl Sunday! We will be chowing down on wings and lots more wings and watching Denver win! Fingers crossed! SAB- Sale-a-bration time! For every $50.00 in SU! product you purchase, you receive a free items (13 items to choose from)!!!! Now Through March 31st, 2014. 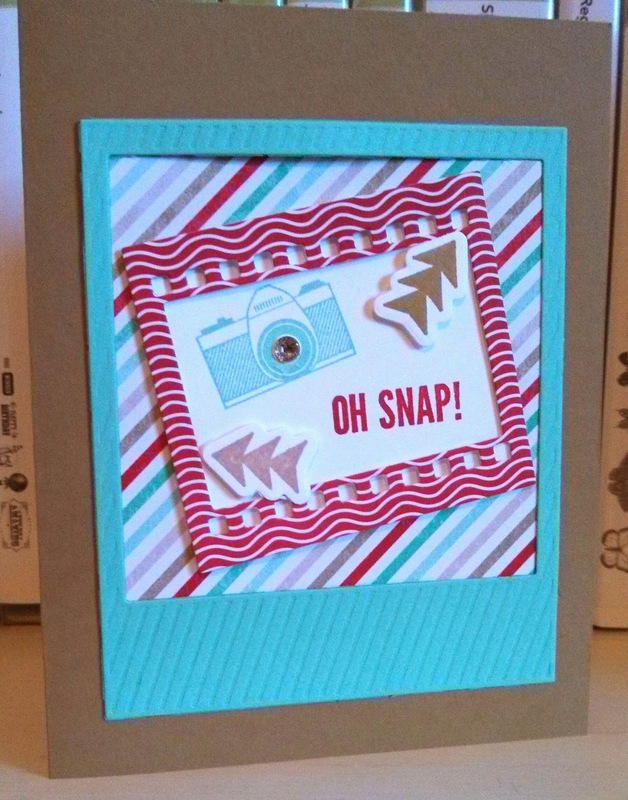 I made 4 of these this week to add to my card stash. I wanted something fun and fresh and for any occasion! 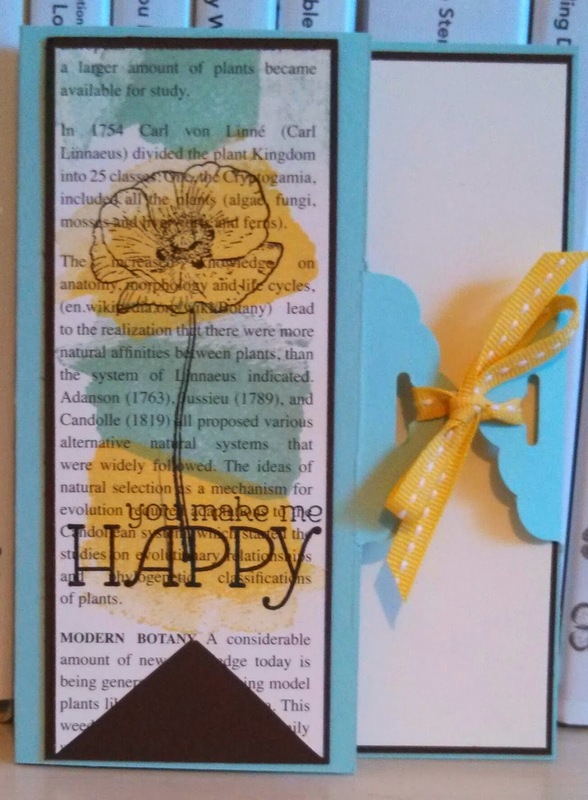 I also have some ladies that come to my classes that purchase cards from me and they like when a card can be for any occasion so it is good to have some of those on hand for them, too. I hope you have a great Saturday and doing something fun! SAB- or sale-a-bration runs from now until March 31st, 2014. For every $50.00 in SU! product you purchase, you will receive a free item from the SAB brochure! 13 different items to choose from and some are kits and MDS digital emsembles!